And that was my introduction to YMM, a group of talented young people determined to support the musicians of the Minnesota Orchestra during their 2012-14 lockout. YMM outside Ted Mann Concert Hall, University of Minnesota, Minneapolis, Minnesota, summer 2014. 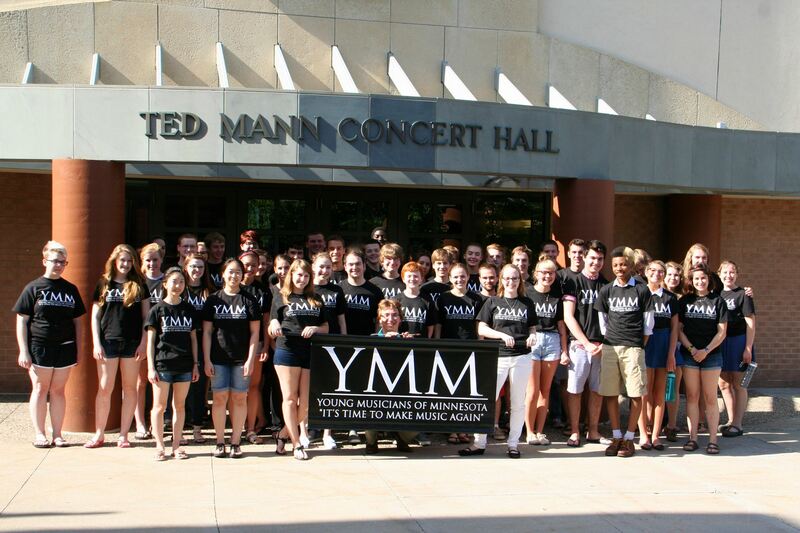 The Young Musicians of Minnesota (YMM) is a student-led and operated organization, consisting middle school through college graduate music students from across the state who have bound together to preserve and promote classical music throughout the state. YMM is entirely student-led, with students taking on roles such as conductor, orchestra manager, logistics advisor, concert event manager, and as performing musicians. YMM serves as a gateway to the professional music world, believing in offering students opportunities to challenge themselves, grow in their musical leadership and technical abilities, develop a greater appreciation for classical music, and work alongside professionals, all for NO COST. YMM members have held a presence in the community through filming our own YouTube video, participating in rallies, performing at the Minnesota State Fair, Orchestrate Excellence forums, our own youth orchestra concerts, chamber performances in the Orchestra Hall lobby, and as well as at We Day Minnesota 2013 (which is an educational event and movement of our time—a movement of young people leading local and global change). Not bad for a teenager!